That's all from Sandy Park, but England's nine-try win is just the tip of the iceberg in terms of rugby today. You can watch Scotland v Wales in the men's tournament on BBC One now and follow the live text here. Or, if you just fancy reliving that game, read the match report here. And, as if that's not enough, we'll also have highlights from the match up on the BBC Sport website soon! They will know what Scotland can do, but it’s all about England and how good they can be. It’s not about if England can win, it’s about how many they can score. England are still on course for the Grand Slam, with Scotland the only side left in their way. The Red Roses surely have the title in the bag too - they're now eight points clear at the top of the table. It's not a fair scoreline for Italy, they did really well. They were in the game for the first 50 minutes of this. England are contracted, they are going to be fitter but I would love to see what Italy do next year in the Six Nations. Italy just need more belief in themselves, and to get more experience in these conditions. It's a big day for the Ruzza family. Lock Valentina Ruzza's brother Federico will be playing for the men's side at Twickenham later today. "I'm going to watch the game on the bus because we have to go straight back to London now," Valentina told Sky Sports. The England players are still out there soaking this up. Some have found their family and friends in the crowd, others are just walking round the pitch applauding the crowd with a massive smile on their face. 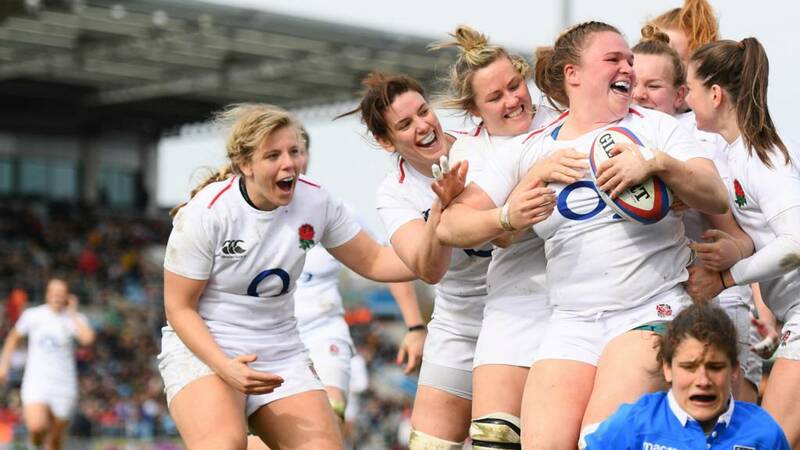 It was on their terms, it was always going to be all about England and to see Vicky Fleetwood come back from injury is great. All credit to England! I've been very impressed with their performance, Italy are a bit different. Their error count was less, they stepped it up another level and for the Grand Slam I just want to see them step it up again next week. England thank the fans and the fans thank them right back with a huge cheer. "As the game's growing we're getting more exposure and it's great to see. "We're still getting to know each other and having this crowd supporting us - we can't ask for more." England form a huddle in the middle of the pitch as the crowd gleefully sings Sweet Caroline. Nine tries and a third 50+ score for Simon Middleton's side in this year's Six Nations. Hannah Botterman drives through to take England to within two metres before Natasha Hunt recycles to Vicky Fleetwood who goes over under the posts. It's an easy conversion for Katy Daley-Mclean. Rachael Burford barrels through and gets England to within 10m. England have a scrum and the clock is in the red so the Red Roses could kick it out, but not yet. Sarah Beckett is announced as player of the match and does not seem to be enjoying her moment in the spotlight. Marlie Packer grabs her hand and raises it in the air, much to the flanker's embarrassment. England look desperate to get over 50 points, but they're making one or two errors again. Luckily for them, Italy are doing the same. The Azzurre get a turnover before gifting possession back to England with a knock-on. Emily Scarratt is the player of the match for me, she really took control. It's a dodgy throw, but Italy gather the ball after a bounce. Hannah Botterman and Shaunagh Brown combine for a huge hit to send Italy backwards. I would not want to be on the receiving end of that. This is relentless from England, they're putting pressure on absolutely everything. Sarah Hunter grabs hold of the ball in the line-out and it's sent to Sarah McKenna on the left wing. The fullback is dragged into touch and Italy will have another chance to get the line-out right. Katy Daley-Mclean puts a lovely kick through and it goes into touch on Italy's 22.